Are you sure your paying the least amount of tax necessary? EXCESSIVE TAXES eating up your business profits? Do you realize many of the worlds largest corporations routinely pay a very small amount of their total income in taxes here in the USA legally? Maybe you are running a business in 2018 using 1980's tax planning advice? Tim and his team provide world class tax planning advice using a wide variety of cutting edge tax reduction strategies. All by taking advantage of the IRS approved techniques found buried deep in the 73,000 pages that make up the U.S. TAX code. Sometimes it is not what you know, but who you know that makes all the difference in where we end up in life. 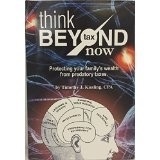 If your running a successful business and paying over $25,000 a year in taxes, The Kissling Tax Method team will provide a NO COST analysis of your current personal and business tax returns, develop a suggested menu of proven tax strategies for you to implement, and only charge you a portion of year ones tax reduction if you hire his team. That's right, no hourly rate, no ongoing fee's! The additional savings in future years goes 100% to you.